Revised December 29 at 12:15 am: The section on the Finch LRT has been moved to the end and expanded to clarify an alternate proposal for the underground connection between the Yonge subway and the LRT station. In the two previous articles in this series on the Eglinton and other LRT lines, I mentioned that the TTC would receive an update at its December 16 meeting on the status of the projects. Seasonal festivities and other matters have diverted my attention, and I’ve been remiss in not reporting on the news, such as it is. The discussion was intriguing as much for its political as its technical content. Two factors, related to some extent, will force decisions that, to date, have been avoided about priorities and about the mechanism of project delivery. With the award of the 2015 Pan Am Games to the GTA, there is a desire to have everything up and ready to go with time to spare before the event itself. This affects both the SRT and the proposed Scarborough-Malvern LRT. Although Queen’s Park, through Infrastructure Ontario, is enamoured of “alternative procurement” (code for private sector development of public infrastructure), actually launching a project on such a basis is now acknowledged to add about one year to the delivery time. This affects both the SRT and the Finch West LRT which were to be delivered in this manner. Under the original project schedule, the SRT would still be under reconstruction as an LRT line when the Games took place in 2015. If this is to be avoided, the start date for the project must be advanced to 2011 or delayed until after the games. The latter option is dubious considering that the SRT is, technically speaking, on its last legs and keeping it running reliably into the Games period may be challenging. TTC staff will report on these issue in January, and another round of public meetings is expected in the same timeframe. Of course, staff will also finally have to produce a design that shows an LRT conversion, rather than an ICTS-centric scheme. They will have to modify the connection at Sheppard both as an interim terminal (the northern section to Malvern is not yet funded), and to provide a track connection to the Sheppard LRT so that Scarborough LRT trains can use Sheppard carhouse. The Kennedy Station redesign is also affected by the LRT conversion as the SRT will no longer be a separate entity from the Eglinton LRT lines. When the Games were announced, there was much talk of accelerating construction of the Scarborough Malvern LRT running east from Kennedy via Eglinton, then north via Kingston Road and Morningside to UofT’s Scarborough Campus (UTSC). What has not been examined in detail, probably because people still think of the “SRT” as an “ICTS” line, is the early construction of the northern 2km of the Malvern line from UTSC north to Sheppard. I suspect that the running time from Kennedy to UTSC via Eglinton, or via a temporarily extended SRT via Sheppard could be comparable, and for a short-term operation would make much more sense. The UTSC site could be served by trains on the S(L)RT from Kennedy and by trains on the Sheppard LRT from Don Mills giving good access not just for people using the BD subway to reach Kennedy. Longer term, this option would provide service to UTSC long before the planned date for the Scarborough-Malvern line. Metrolinx is considering this option, but the TTC and City are plumping for funding of the full Malvern LRT line. The “alternative financing procurement” (AFP) issue arises because the contract with the private developer imposes an extra layer of complexity, preparation and management that does not for a project delivered in the “traditional” manner by the inhouse TTC project. Any private arrangement must have a defined product along with a mechanism to ensure compliance, and design must reach a detailed enough stage that a bidder can make a concrete proposal. This pushes back the start date for any project using alternative procurement by about a year. In the case of the SRT, it would likely not be possible to make the target date for completion, according to preliminary comments at the TTC meeting, if the new line was to be up and running by the winter of 2014/15, well in advance of the Games. In the case of the Finch West line, the delayed start triggers a political problem because there is so much focus on Scarborough. Why should Downsview and Rexdale have to wait behind reordered priorities that could complete the Scarborough LRT network all in the name of serving the Games? For all of Transit City, the TTC will deliver the projects on Metrolinx’ behalf, but we don’t yet know how the next layer down will work for the AFP projects. However, regardless of how the new lines are built, the TTC will operate and mainten them. The TTC will have a program manager within their Transit City department responsible for the projects. In theory, this should provide one-stop shopping for a number activities that were at times disorganized on the St. Clair project. The TTC and City will co-ordinate all construction activities, including those of utilities, to avoid scheduling problems, minimize effects on neighbourhoods, and to simply keep everyone informed of what is happening. Detailed information will be maintained on the project websites, services such as Facebook, and other media. The real issues here will be timeliness, accuracy and completeness, all weak points in TTC web-based information sources. An important change from the St. Clair project will be an attempt to bundle utility work into the main LRT construction contracts rather than having each part of the work proceed separately under different contracts. This will ensure good planning and co-ordination because the same company will do all of the work in a section of the route. Better scheduling should also be possible so that affected parties and neighbourhoods can know when to expect work to affect them and to be completed. One troubling aspect is the development of a standard 36m street cross-section for the LRT lines. This is all well and good where 36m is available, but in some cases this is not true. On Finch from Yonge to Bathurst, the City plans to widen the street to 36m based on a long-standing part of plans for the area. Other parts of the Transit City network are not so simply to address, and as I have discussed here before, parts of the TTC are still in denial about the difficulties of placing a reserved lane (regardless of the vehicle technology) on a narrow street. City Council has approved acquisition of properties for maintenance facilities on the Eglinton and Finch West lines. The Eglinton property is at the old Kodak lands in Weston, while the Finch property is between York Gate and Norfinch. Sewer and watermain replacement on Sheppard. GO Agincourt grade separation. This would have occurred eventually for improved GO service on the Uxbidge Sudivision, but construction of the LRT line provided the trigger to get this done now. The detour road is under construction, and the actual grade separation work will occur in 2010. Two LRT and road contracts will be let in 2010, and the target opening date is September 2013. This project originally included an extension of the RT to Malvern Centre, but the funding provided will only take the line to Sheppard as a first stage. This is now an LRT conversion project, not an ICTS project, and its scope is therefore greater than a replacement of Mark I with Mark II ICTS technology. Both the ICTS and LRT options cost roughly the same for the existing section of the route from McCowan to Kennedy. Now that the line will be both extended and will be part of a larger LRT network, the ICTS option does not make sense economically or operationally. The shutdown time for an LRT conversion was projected to be quite long relative to Mark II ICTS. Since then, the changes needed for the ICTS option have turned out to be greater than originally expected, although still not enough to make the shutdown times equal. The TTC should produce a project plan that maximizes the amount of work that can be done before a shutdown is required. The original construction start was projected as 2012 with revenue service in 2016. However, as noted above, this conflicts with the Pan Am Games in 2015 when all services should be operating. We will learn in January what sort of construction schedule the Games will require. The TTC is now developing a schedule for the project, and is designing the at-grade sections of the line. Construction of the at-grade portion from Jane west to Commerce Blvd. will start in mid 2010. The tunnel boring machines (TBMs) will be tendered in spring 2010, and the tunnelling launch site (east of Black Creek) will be tendered in the fall. These jobs are timed so that the launch site for the TBMs will be ready when they are delivered in late 2011. The opening dates for each section remain 2016 (Renforth to Eglinton West), 2018 (Eglinton West to Kennedy) and 2020 (Renforth to Airport). The EA for this line was also on the agenda for this meeting, and it was approved for transmittal to Council where it will be discussed in late January 2010. Panels from the last round of public meetings are available on the project website. Geotechnical studies as well as structural analysis of bridges on the route is underway, and a draft feasibility study of an extension to Woodbine Live! and Pearson Airport is complete. This material has not yet been released and, no doubt, suffers from the same uncertainty about routing through the airport as the Eglinton LRT line. Construction start is planned for 2011 with revenue service in 2015. These dates may be revised depending on the outcome of discussions about procurement and project management (see above). An illustration in the Commission presentation (not available online) was slightly different from that in the panels linked above. Finch-Yonge station’s connection between the two lines is very roundabout. The more recent illustration shows the arrangement in a 3D view rather than only in profile. In a masterpiece of understatement, a note on this drawing says that “refinement of concept to enhance passenger transfer convenience will be conducted during preliminary design”. That’s putting it mildly. The proposed arrangement requires passengers to descend two levels from the LRT station and then arise onto the subway’s centre platform from below. The problem arises because of the relative elevations of the station components and the placement of the LRT station. In the existing station, the subway is two “levels” below grade while the mezzanine linking to the various entrances and to the bus loop is one below. The LRT station would also be one below and would fit between the roof of the subway structure and Finch Avenue. The LRT station is centre platform and cannot, therefore, directly connect to the existing mezzanine. If the LRT were a side-platform station, then it could operate something like the Sheppard-Yonge connection with at least the north (westbound) platform having direct access to the subway mezzanine. A link from a centre platform or an eastbound-only platform would go under the LRT structure and then back up into the mezzanine. It is ironic that a surface LRT station would make the simplest transfer connection to the subway, structurally, although it would completely foul up access to the bus loop and traffic on Finch Avenue. 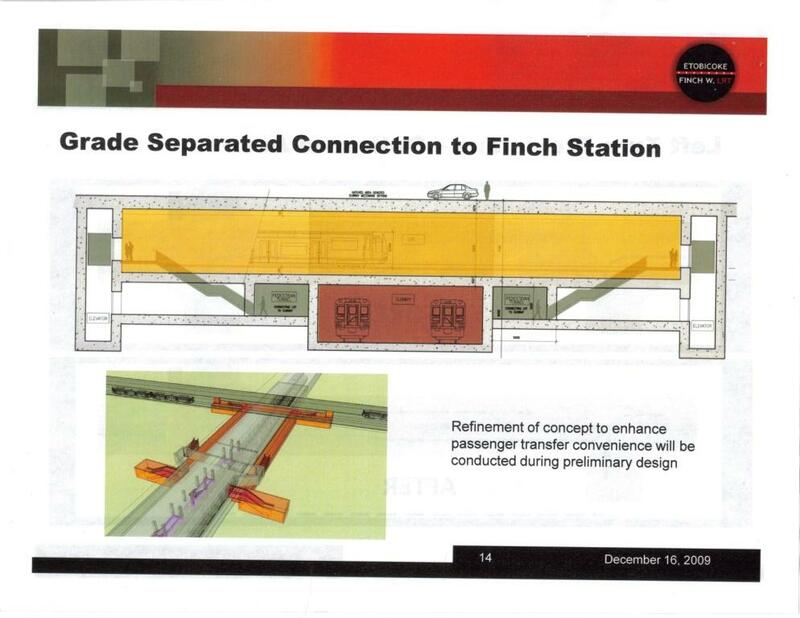 The proposed LRT station is directly under the Finch/Yonge intersection straddling the subway. If the LRT station were further east, the lateral connection described above would connect into the mezzanine level passageway between the main part of the subway station and the bus loop east of Yonge, and there would be no need to dig down below the existing subway structure. This entry was posted in A Grand Plan, Eglinton LRT, Finch West LRT, Scarborough RT/LRT/Subway, Scarborough-Malvern LRT, Sheppard East LRT, Transit. Bookmark the permalink. The Canada Line was supposed to be bored. The bid entered by the private firm was for a bored tunnel. However, they built it via the much cheaper cut-and-cover method, which shut down the street overhead for a long time and caused many losses to small businesses, and still got paid the full amount. What I’ve been wondering lately is whether or not any TC lines are actually see MU train operation as per the computer-generated videos. Steve: That is the plan, certainly for Eglinton and the converted RT, probably for Sheppard. Steve: This confirms what I have been hearing for some time and have blogged on here with the predictable war of opinions on both sides of the issue. I made a deputation to the TTC at the December meeting on the gauge issue. The text of it is on my blog. I wonder if they can do a cost-benefit analysis of this decision, or if they just make things up as they go along? Steve: Most LRT systems world-wide run with double-ended cars/trains as do almost all subway systems. The issue is not simply putting a loop on land now occupied by a bus loop, but of having great flexibility in the location of turnback points on the line. This is particularly important where lines are underground such as on Eglinton and, for their terminals, on Finch and Sheppard. The TC and City fleets are each large enough in their own right that the ability to interline (even assuming a track connection existed somewhere) or to share cars is a moot point. Notably this would be a one-way arrangement in any event because the TC cars will not be able to navigate the “city” trackage. As for maintenance costs, the only parts that are duplicated within a car are the cab controls. There is still one set of electronics, one set of motors, one set of brakes, etc. The flexibility of double-ended operation greatly exceeds the cost of an extra set of controls. I find it funny that Metrolinx’s bs argument about economics is countered by a spokesperson for the TTC Transit City projects in the article. I won’t repeat my previous comments here but I will say that the attitude that the new lines and any equipment will operate entirely in isolation forever is extremely unfortunate. This guage decision will force that to be true and could eventually do great damage to the political will to maintain the legacy network when all of the track and new vehicles hit end-of-life at roughly the same time. Beside the dual set of cabs and controls there are also twice as many doors which must be maintained. These doors have another “cost” in that they remove seats from the vehicle. Given those extra costs I think that double ended cars should be used because of there extra flexibility for “short turning” especially in tunnels. The only problem seems to be that the TTC is not putting in many emergency crossovers. If I remember correctly Finch has one at Keele, and one out somewhere near Islington. That is not a lot. I can see where pocket tracks are an added expense but what is the cost to put in trailing point crossovers every concession road? It is much cheaper to do it when you build the line than find out you need them later. Did I read somewhere that the TTC is thinking of putting back in some of the crossovers on Yonge that they removed? While the Legacy and the TC cars will not be interchangeable they should use similar controllers, doors, motors etc. so that they could us the same supply of spares. The question is will the TC cars have all trucks powered as the Legacy cars are supposed to? Steve: Yes, the crossovers at Rosehill, College and King are to be reinstalled as part of the lower Yonge resignalling project. The double side cars may have fewer seats but unlike the high floor cars (and HF buses) that space is usable for standing. Having double side doors also means both island and side platform configurations are usable. Furthermore, DE cars can use loops but SE cars can’t use crossovers. The size of the downtown network and fleet will exceed that of several other cities combined. It will be a more truly common system than the CLRV/ALRV fleet. We maintained a fleet of 28 cars on standard gauge for this long, we’ll figure it out for the downtown network of 8 times that many. Regarding Mark’s comment about DE cars being able to use loops. that is what I think the TTC should do for the 3 LRT lines at Kennedy Station. Any sort of stub ended platforms is going to make for a hideous transfer between LRT lines. If they all came in on either side of a common platform, one side for SRT and the other for the two lines on Eglinton it would make the transfers simpler and reduce the number of escalators, elevators and stairs needed to reach the subway. It would also make it easier to run cars from one line into the other, especially for car house, excuse me maintenance storage facility access. This is one location where a loop would probably be more efficient than crossovers and stub end track. Unless the doors have passenger request buttons every door on one side will open every time the car stops so the doors might actually get more use. Even GO has finally started to use the passenger request buttons for trains that are sitting at terminals for 33 minutes. Standard Guage completely blows the chance of seeing long-term subway conversion of the Eglinton Line. That will never happen if it cannot be integrated with the rest of the existing subway system. So now what’s going to cost us more, huh? Not that I was advocating for it, but why dig a subway-sized tunnel and never use it as such? What sort of blackmail forced the TTC to agree to this? Steve: Queen’s Park is paying for it. Actually, I doubt that there will ever be a need to convert the Eglinton line to “subway”, and higher capacity, if needed, can be provided simply by running longer LRT trains and extending the subway section to keep the line completely grade separated. Eglinton will have its own carhouse, and if we need a fleet of standard-gauge “subway” cars, that shouldn’t be a problem. The biggest challenge would be platform width and height if there were a new generation of “subway” cars on the line. The gauge is a comparatively minor issue. The same in reverse goes for the Sheppard Subway – it will never be converted as an interlined route with the Sheppard East LRT because the subway is TTC Gauge. A lot of people were getting their hopes up for these potential, if unlikely, conversions down the road. The gauge change may seem minor but given the mis-information and lame excuses thrown about at the moment we will surely be faced with similar poo-pooing in the future about ‘standards’. Metrolinx placed ‘fantasy’ future lines in southern Ontario over existing and future needs in Toronto. Once again the attitude that Toronto is always wrong pervades. I just want to bring to everyone’s attention that a group called Save Our Subways (saveoursubways.com) should be ignored. They believe Transit City is a terrible plan and subways should be everywhere. They are even thinking of persuading the next mayor of Toronto to extend the Sheppard Subway to STC and have the Sheppard East LRT run between Kennedy and Meadowvale. Please do not support this group if you come into contact with them over the next several months! Sorry Mr. Munro but I had to say this because as a transit rider, I do not want these great LRT projects delayed by a bunch of LRT haters. Steve: I have made a point of not commenting about their website as it has so little content. We will see who becomes the next Mayor, and how he would pay for the mad schemes of the subways group. The SOS report is currently designed for the general public and not for transit experts. They plan to add more detail to the report in the future. Would you be interested in having a ‘healthy debate’ with the Save Our Subways (SOS) group to show the general public that TC is better than building subways? I really think it would be great to have a meeting at City Hall or Metro Hall, place the two plans side by side, compare and contrast the two plans, and then have everyone (i.e. politicans, general public, transit planners,, etc.) comment on it. Steve: I will comment on the specifics of your plan separately, but I have two major concerns here. First, as you will know from reading this site, there are aspects of Transit City I would change, and there are projects that are not part of Transit City proper (eg the DRL), but should be on the table as part of a larger overall plan. I refuse to debate a “Transit City” vs “SOS” network because the starting premise is faulty. Second, we have already seen how attacks on Transit City have become a surrogate way of attacking the TTC and Adam Giambrone. As a mayoral candidate, Giambrone has to stand up for himself, but I don’t want to have a “debate” on the merits of plans that skewed as a political attack rather than a clear review of the need for various schemes. A public meeting such as you propose would almost certainly be stacked with proponents of various candidates, and it wouldn’t be a debate, just an ambush. I am not running for mayor. Steve is actually pro-subway for the DRL so how is he to provide balance against a group that seems to not be pro-LRT under any circumstances? We’ll have to find a bigger streetcar zealot than our host here… any suggestions? Steve: For what it’s worth, I am also partly responsible for as much of Eglinton being underground as it is. Gotta keep those tunnelling engineers busy!